Reading about others' experiences will help you better understand more of the possibilities for your child. If you haven't yet, please read Abigail's Story. Walking this path with other families has provided great comfort for me; these beautiful children and their parents have helped me make my journey. Some have chosen comfort care (as we did), some more aggressive intervention. Some were delivered by c-section and some weren't. Some had older siblings; some did not. By reading these stories, I hope you can relate to some of the situations and feel more comfortable about the decisions you have to make. And I hope that you will realize that you, too, can do this. You can meet some of these children in Abigail's Friends. 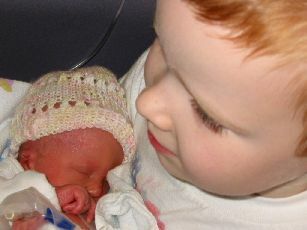 You can find more stories of babies with Trisomy 18 on the Trisomy 18 Foundation site, in the Family Profiles section. The Trisomy 18 Support site also has Message Boards where you can meet others and learn of their stories and see how they have handled different situations and decisions. Start with the Sharing our Journeys board. The T18 Moms Site is a site created by a mom who lost her son to Trisomy 18. It also links to many other stories of children with Trisomy 18. She also offers to help you create a site for your baby if you would like one but don't know where to begin. I think you will see that these children's lives are just beautiful, no matter how brief. And that their parents and others around them are changed forever because of their lives. What a powerful legacy these little ones leave! If you would like me to add your baby to Abigail's Friends, please Contact Us and I will be happy to add your child. This page updated May 3, 2006.